Horizons arise from causality, and delimit any observer’s zone of ‘vision’ (past and future). They are dependent on the observer’s position. This is the maximum straight-line distance which could have been travelled by a light ray since t=0 (i.e dp is the radius of a sphere enclosing all the other particles that could have been seen. dp(t) is the particle horizon distance. Event horizon encloses all parts of the universe which in principle can be reached (although in practice it could take a while to get there). Copernican principle: the universe is the same whoever and wherever you are. Obviously this is not exact, but it holds better on increasingly larger scales. Homogeneity: the universe looks the same at every point. Isotropy: the universe looks the same in all directions- there is no need to invoke any centre of the expansion. Note: homogeneity does not imply isotropy. Friedmann equation (non rigorous derivation). This equation describes the expansion of the universe. Method: find kinetic and gravitational potential energy of a test particle in a uniform expanding medium with mass density ρ- then use conservation of energy. As the universe is homogeneous, we can take any point as the centre. The test particle has mass m, and from Gauss’ Law, only feels a force from the material at smaller radii. U is a constant for a particular particle (not necessarily the same for particles at different r). Put where k is curvature (see later). This is the Friedmann equation. The fluid equation: now we need to describe the density ρ of material in the universe, and how it evolves. Consider a volume V with unit co-moving radius (so r=a). This is the fluid equation. Dust: cold, non-relativistic matter which exerts negligible pressure (p=0). These are the two equations of state we will need for the next section. For a dust dominated universe, solve the fluid equation for the dust equation of state. Density falls off in proportion to volume- not unreasonablr. Remember, when ­t=0, a=0, and a0=1 by convention. Substitute into the Friedmann equation with k=0. In this solution, the universe continues to expand forever, but the rate of expansion becomes infinitely slow with time. Universe still expands forever, just more slowly. Note here that – an extra power is picked up here because the wavelength is stretched by the scale factor. We can solve the equations exactly for a mixture, but to get a feel for what is actually going on, consider the long-term evolution of a universe where one or the other dominates. Density of dust falls off more slowly and will come to dominate. As dust comes to dominate, the expansion rate speeds up from to . Destiny of the Universe: For the expansion of the universe to stop, we need the Hubble Parameter H=0. 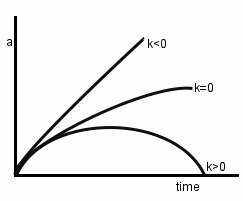 If k=0: in this case, the Universe expands forever, although the expansion is continually slowing down. This is known as a flat, Euclidean universe. In a dust-dominated universe, the first term on the RHS , so the second term will eventually dominate. Expansion becomes faster, velocity becomes a constant -> free expansion. If k>0: H can now be zero if the RHS terms in the Friedmann equation cancel. At large times, the second RHS term dominates, but is now negative; because gravitational attraction will still persist, collapse is inevitable (the Big Crunch). 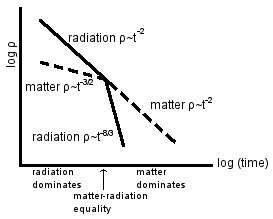 Density parameter and critical density: once again, we go back to the Friedmann equation. If ρc exceeds this, k>0 and the Big Crunch is inevitable. The density parameter, is just a way of quoting densities in terms of the critical density. The cosmological constant: we can introduce a new term into the Friedmann equation. 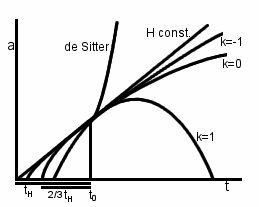 where Λ is the cosmological constant. Thismay be thought of as representing a zero-point or vacuum energy, or perhaps even ‘dark energy’. Matter contribution to the density parameter, ΩM: this is not easy to measure. Cold gas content- as well as stars, there is also cold gas which has failed to form stars, and low-mass non-luminous stars (‘Jupiters’). Light element abundances and nucleosynthesis models give 0.01<ΩM<0.04. Galaxy rotation curves- as we saw earlier, velocities in galaxies do not fall off as . This suggests that galaxies are embedded in halos of dark matter, with ΩM~0.1. Bulk flows- the motions of galaxies relative to one another appears to suggest that ΩM~0.3. By considering all these things, we can get ΩM up to 0.3, but analyses of CMB anisotropy suggest that the universe is flat, so in fact it should be close to 1. How can we reconcile this inconsistency? (note that a2H2 is sometimes called –Ωk). Evidence for the existence of a cosmological constant is provided by Type IA supernovae, which act as standard candles. Age of the universe (t0) is defined to be the time elapsed since the scale factor a was zero, but in some cosmological models, a was never zero- these models are said to be without a big bang. We can use the Friedmann equation to find the age of the universe if we know the dust content, radiation content and cosmological constant (a walk in the park, then…). Fundamental cosmological parameters: by these, we mean H, ΩM and ΩΛ. The Hubble time: remember, Hubble’s Law says that v=H0r; remembering that speed=distance/time, and ignoring the fact that H is not a constant in time, the age of the universe is roughly H0-1 (10-20 billion years). This is the Hubble time. 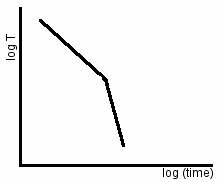 If the expansion of the Universe proceeded at a constant rate, then the Hubble time would be precisely equal to the age of the universe, t0. In fact, this would only be true in a completely empty universe which did not contain any matter to cause gravitational deceleration (in which case there would be no one there to care about the age or geometry of the universe anyway). Time scale for a flat, dust dominated universe: remember and , so . This is shorter than the Hubble time by a factor of 2/3. Closed universe- Big Crunch occurs at 2tmax. t=0 occurs at different times in the past for different models. How long until the Big Crunch? : We begin, once again, with the Friedmann equation. For a closed universe, k=+1. Now find the time taken to reach amax. Substitute using and integrate from 0 to amax. When a=a­max (first time we reach this is at θ=0). Redshift and time: for an Einstein-de Sitter universe with ΩM=1 and ΩΛ=0, objects at redshift 4 tell us about the universe when it was 10% of its current age and redshift 5 about when it was 5% of its current age. Since 1996, galaxies at redshifts 4.4, 4.92, 5.4 and 6.7 have been discovered, so we have a high lookback time for those objects. : time-like- information can reach here from O (the origin). : space-like- information cannot reach here from O. Note that the sign of can be the other way- it’s just a convention, and one that even my lecturers differed on. so if Ω=1 then the LHS goes to zero and remains zero for all time (so Ω=1 forever)- but what’s going on on the RHS? 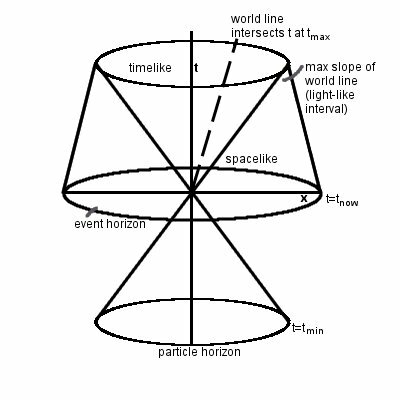 So Ω-1 is a function of time; we would not expect Ω~1 to be the case for all time, unless the universe was very, very close to flat since the beginning. For curvature not to dominate at large t, it must have previously been very small compared to other terms. This seems like quite a restrictive limit- any little fluctuation and the universe would be very different. This is the flatness problem.